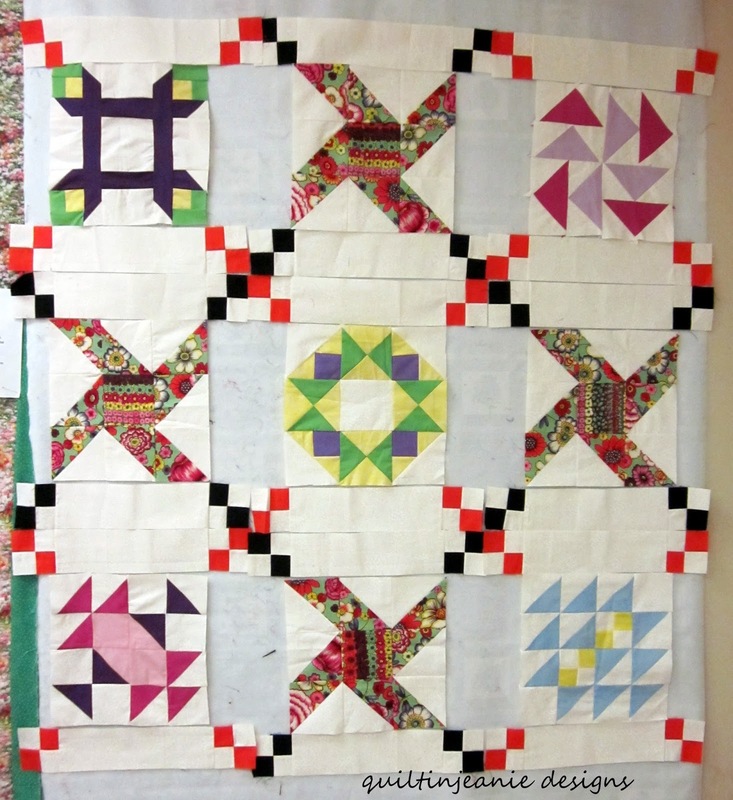 It's always fun to see the sampler quilts progress from month to month. 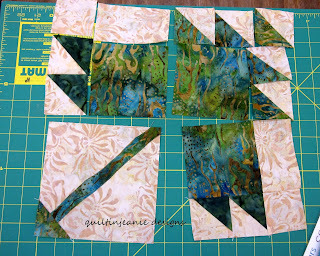 The Highlights sampler is nearing the end and so the first group's blocks are really shaping up. 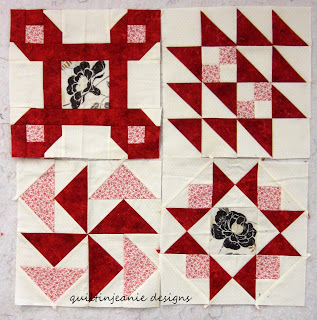 Laura was worried that hers were too busy because of her repeating block, but I reminded her that they all had a border around them that spreads them out, so once we did the layout with some of them in place, it took on a different look. She liked it much better. Jane has been working on two quilts at the same time; one with a yellow background for her grandson and one with a green background. She decided she had enough blocks finished to put together the yellow one, so she brought it to class last week. 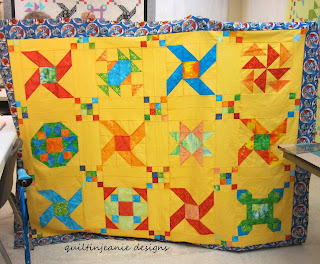 You can see she made her Eccentric Stars out of different fabrics. I love it this way too. Here are the green ones and last week's block. So pretty. 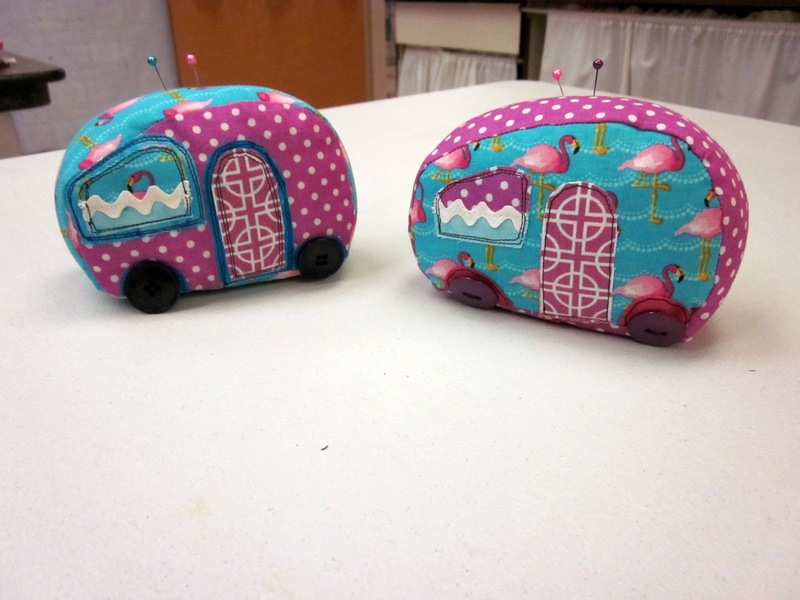 She also made these adorable camper pincushions for a friend and brought them to show us. 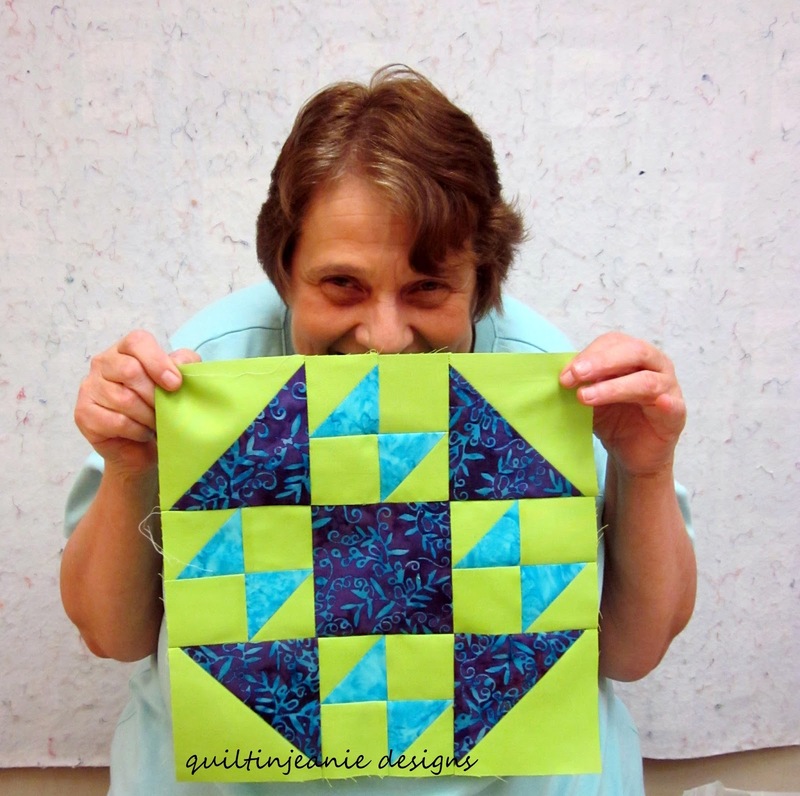 Diana is working with three fabrics and her background on this quilt. I love her placement of the fussy cut flowers. That is her border fabric, I think. 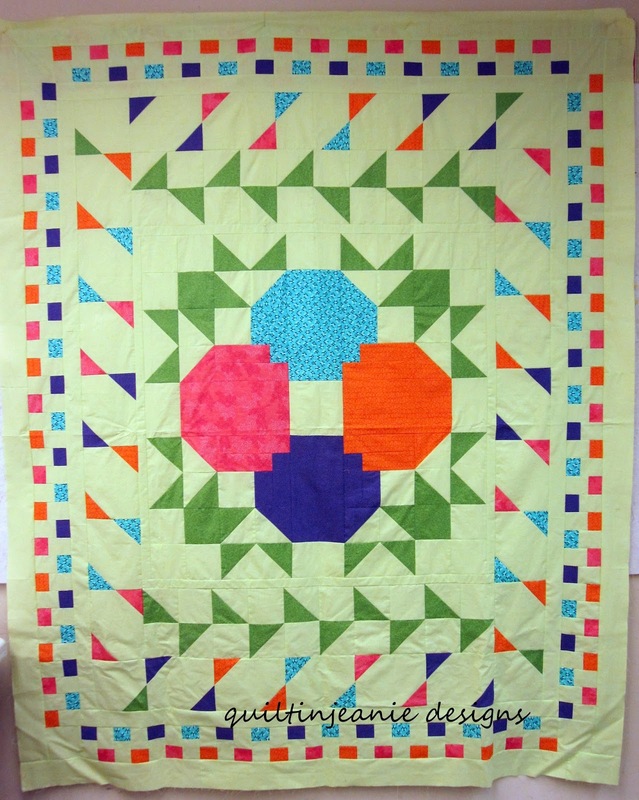 It's great when people add their own ideas to your design. 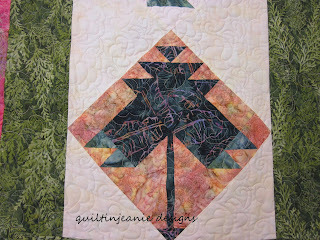 The To The Point sampler group worked on this leaf block last week. We all think it looks more like a tree. 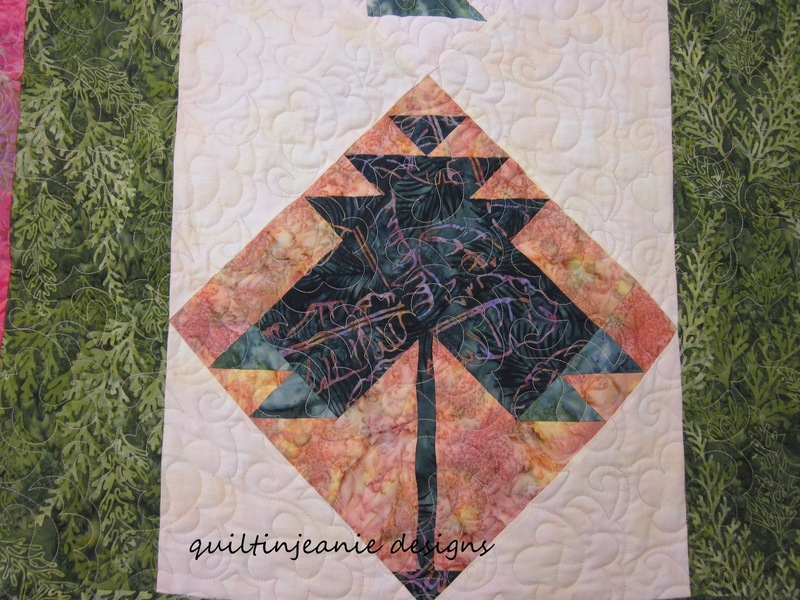 That is mine from the quilt below. We talked about how different the blocks look when set on point and put some on the wall to see. I forgot to take a pic of them straight. Some blocks are more interesting on point. 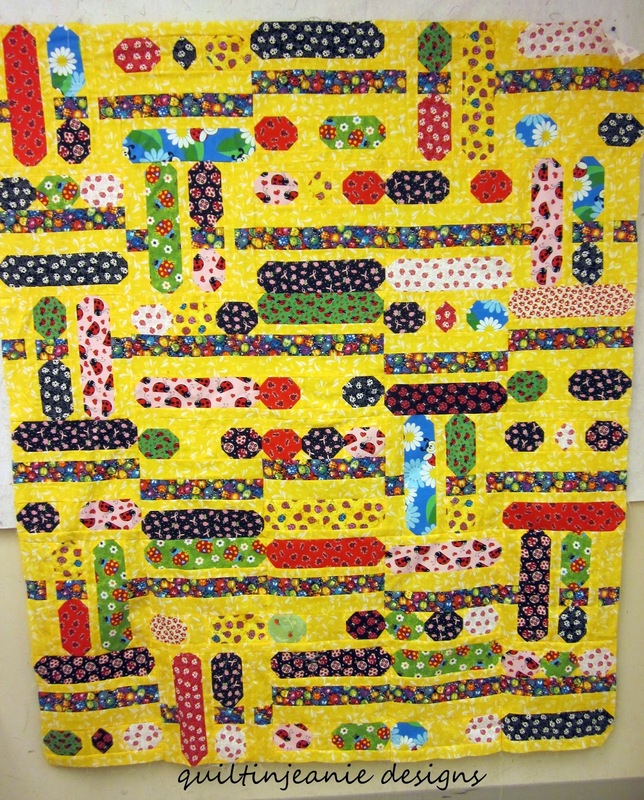 Dianne has been working on her Beads, Buttons and Baubles quilt the past two Tuesdays. 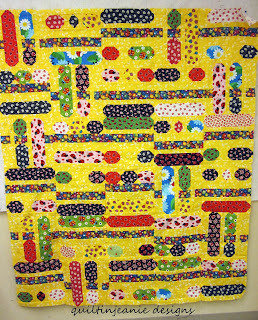 It's looking good and with all of those bug fabrics, I think she should name it Beetles, Bugs and More Bugs! 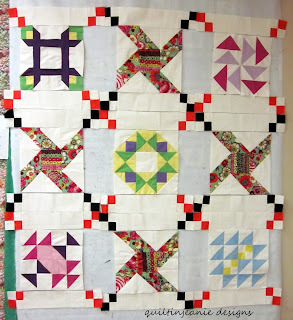 I have been working on a lot of class stuff, but not sewing the past few days. 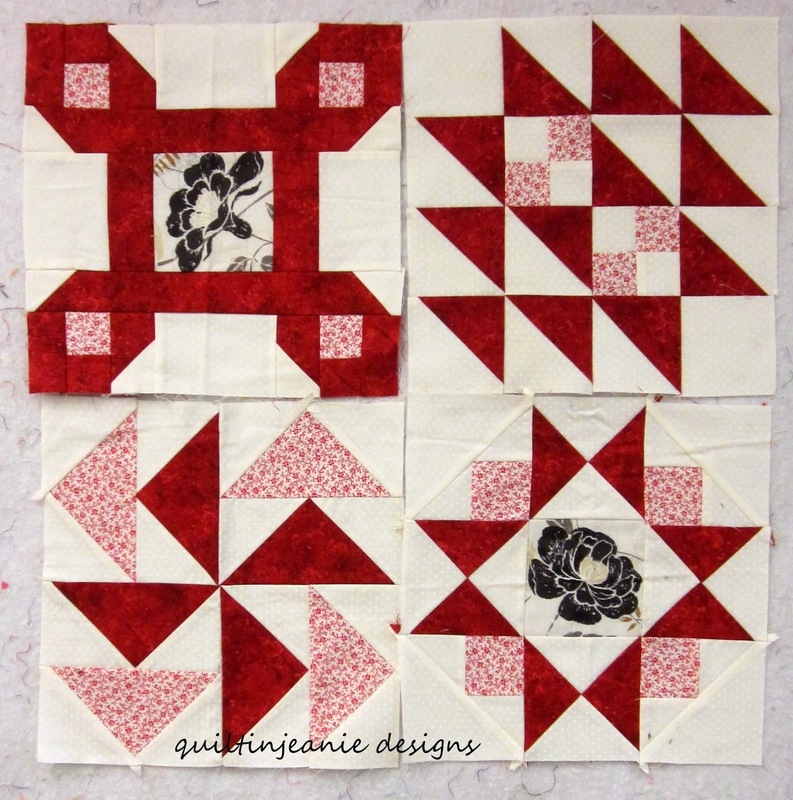 I'm working on the Simply Posies Sampler 21 pattern, which is going very well. 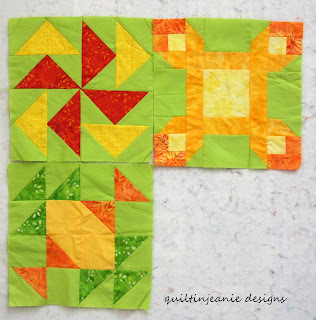 It's sort of the sampler that's not a traditional sampler, but I love it! I wish I could've gotten it quilted before I hung it at the store Wednesday, but it's actually easier to display the larger quilts in the classroom as a flimsy, so I guess it's ok. 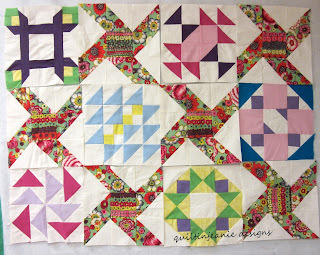 I may get it done yet this summer! I've also been working on the weekly sewing, posts and patterns that go along with the Red, White and True Quilt Along. 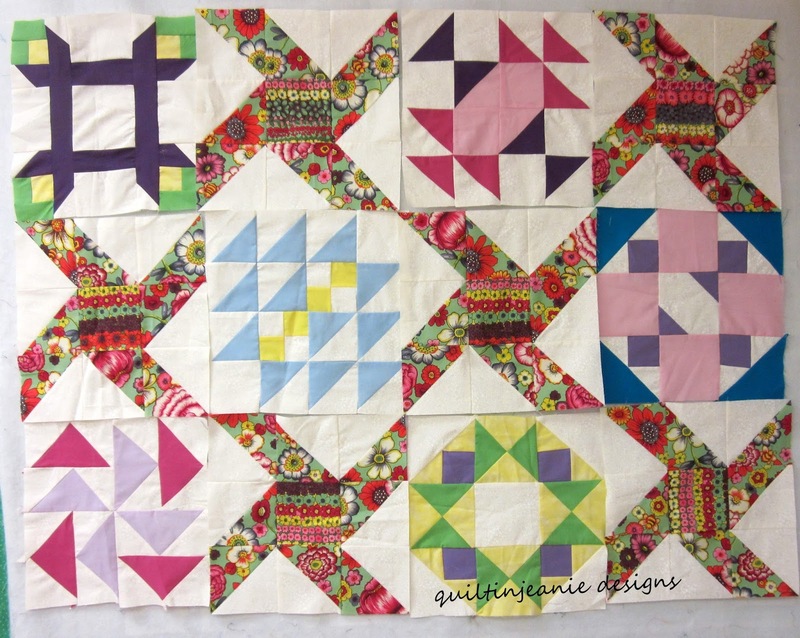 (You can find all of the info on the quilt along on the link above.) 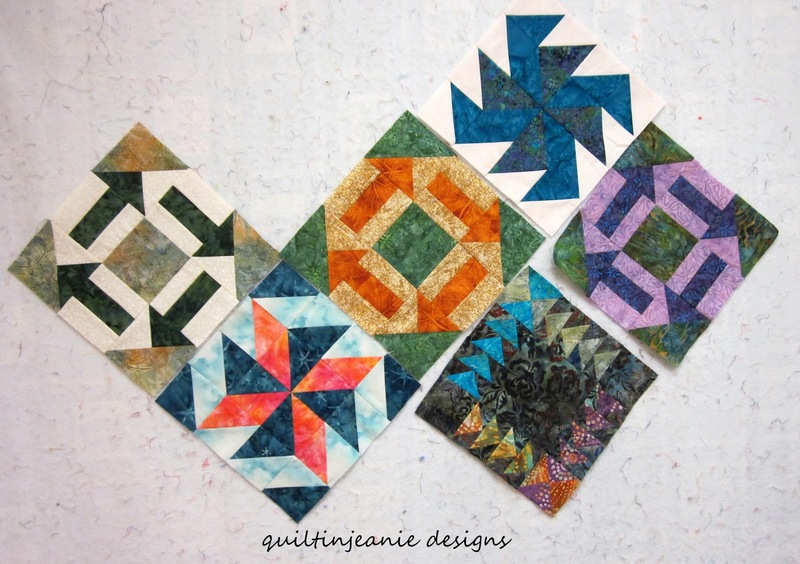 I'm really getting excited about it and anxious to cut out my second quilt and sew along with everyone.Have you picked out your fabrics? There is a Flickr group you can post pictures to so we can all admire them! I will be posting the cutting directions on Mon. 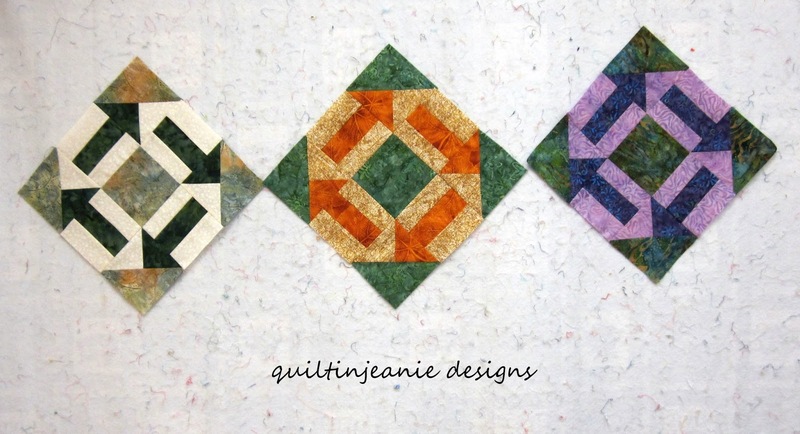 June 22, so have those fabrics pressed and ready to cut! Are you joining us? 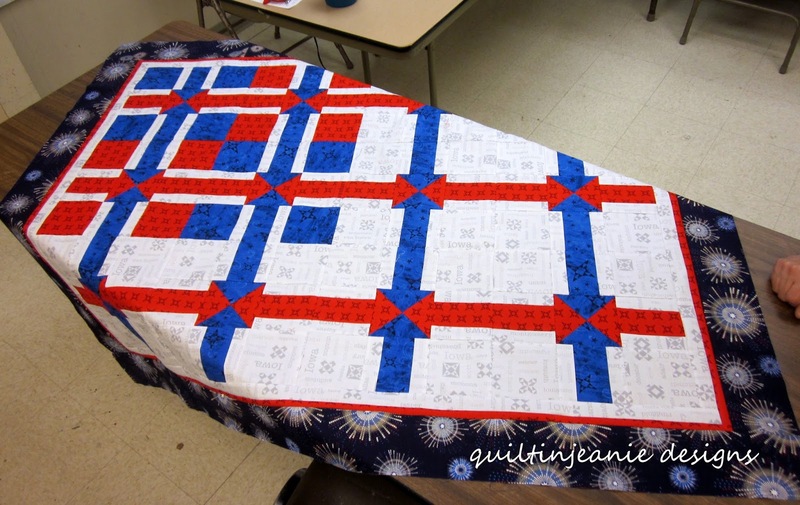 I am going to load Red, White and True on the frame today and try to get it quilted. It's smaller and shouldn't take too long. Wish me luck! I love all the color combos and the pincushion is adorable. Fun Fun Fun! 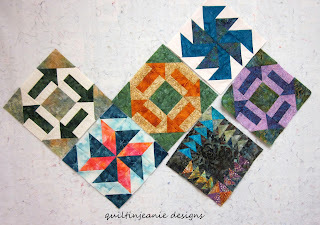 So fun to see what every one is making. Thanks for sharing. Everyone is so productive and I love those little campers.